The Xbox 360 Saprano Case Water Cooled!! Soprano elite. The final revision of the three setups. Firstly I bought this case from Ebay, I picked it up and paid for it. It was well worth the price and came with some extra fans and a neon Blue cathode which I decided to keep on. 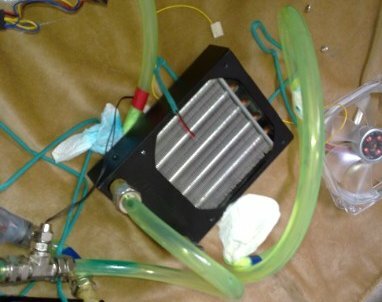 This mod has everything that I have taken out from all of my previous water cooling mods. It consists of the Thermaltake big water 745. 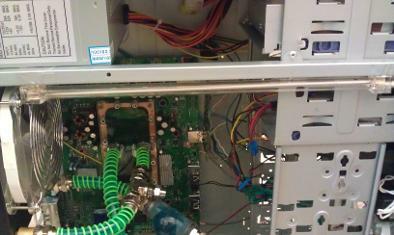 The pump failed a few times whilst leak testing so I replaced it with a OCZ 500 lph which I bought from Ebay. So I've drained the water inside and now ready to strip up the Xbox and the setup and now ready to plan everything out (in my head). This is the 120 mm Radiator i'm going to use to cool the liquid after it has been heated by the xbox 360 cpu. I have removed the fans so i can install it easier once I have inserted the new tubing. The fan that I will use to extract the heat from the Rad will be UV BLUE, It will make a nice effect once alongside the UV water piping. Here you can see the Xbox 360 motherboard exposed and bits all over the place. The water block that is place on the right of the Xbox 360 motherboard has some thermal paste stuck on to it which I will have to remove and replace to ensure near perfect heat conductivity between the chip sets and the copper water block! Also as you can see on the motherboard that I have made some of my own mini heat sinks to go on the ram chips because as the original case is not present which now causes abnormal heat and air flow throughout the system. Putting these chips on will reduce the risk of overheating on the ram chips. This improves the stability of the system dramatically. I have taken the metal cage at the back out of the system because the ports on the Xbox comes in the way of this cage and so I will have to cut some part of the cage to access those ports, but instead of that I removed the whole thing so I can make my own custom back plate. As you can see, it's very open now rather than having some metal frame there in the way of the xbox A/V ports. I have now inserted the Xbox 360 motherboard and the water block inside the case. I have also made screw holes and made spaces for the motherboard mounting screws to be fitted on. With projects like these there are two major problems, 1) Custom fitting and forcing things to fit and 2) the electrical Wiring, everything has to be bob on or else you may have to rip open the whole project up again and its happened more than once with this project! Talking about the electrical wiring, this is one of them. What I've had to do here is weld up wires to the LED's and power button on the RF module. The LED extension wires will be used to extend the LED's as it would be very hard to see the lights through the case therefore by extending and putting extra LED' s on the case to represent the players would be much easier. Also I have linked up the power button the power button on the case so you can use the case power button to power on/off the console which is ideal for this mod. As you can see I here I have inserted the dvd drive. I have fitted the whole thing into a normal cd/dvd drive metal casing which allows me to insert this drive straight because the xbox drive is alot smaller than what the thermal take soprano case takes in. I had to modify the dvd drive alot to get it to fit in the pc case i.e cut legs off, break metal clips etc.. But it went inside at the end. Now I have inserted the water tubing and have fitted the 120mm Rad inside. As you can see the water block is quite big, this is because it covers two processors and therefore needs double space. Just this water block was purchased for £50 from Hong Kong. Now the progress of this project seems to be coming on. 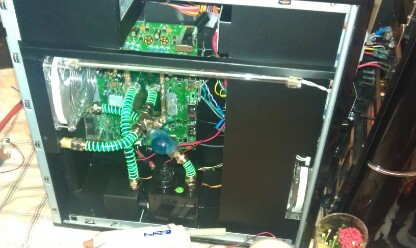 I have cut the tubing that connects the Rad to the water block up and inserted a temperature gauge in between. The temperature shall be displayed on a little monitor that fits in one of the CD/DVD drive bays. This kit is part of a Thermal take M9 set in which also comes a water level indicator. This is very useful as is the water level reaches below the minimum, then the system starts beeping until your either switch it off or you top up your water. Now I have inserted the key parts for the water cooling system which is the Pump and the reservoir. The pump takes the water from the reservoir directly and then pumps the water upwards towards the copper water block, then the water gets heated up through the processors and then goes to the RAD which then cools it back down. At the moment the tubing between the rad and the reservoir (to complete the circuit) is missing because I am thinking about inserting a flow meter which shows if the water is getting pumped around because this water pump that came with the set has indeed failed a few times and so to have a flow meter is very Ideal. I have wired everything up, this is the most crucial part of the mod as if you have got one mistake then some part of the appliance may blow up and you will have to buy a new one. ( This did happen to me whilst I was messing about with the fan speed controller but Its all working ok now) You have got to review each step you take when installing wires because sometimes what happens is that the tangle up with each other and makes a mess. Anyway, I have left this on for about 1 - 2 hours to make sure every electrical appliance from the pump to the fans are working ok. I did not switch the pump on for long as its a water pump and will burn out if I switch it on for long. Just a close up of what's going on inside the console. I have also wired up the DVD drive to the motherboard up. The original cables are about 3" in size so obviously that could not reach the top when inserted so I inserted a normal length sata cable from the mobo to the DVD drive and extended the power cable. Extending the power cable took an awful amount of time as each wire had to go to its right wire on the other side or else we would be having some serious problems. This is a tricky mod as what I have done here is inset the 4 LED lights to replace the Xbox 360 player light. ( see pic 8 ) I have also put in two switches, one switch ( left one) controls the whole power that comes from the PC case power supply i.e fans, pumps, lights etc., the other switch ( round one) controls the Neon Blue cathode that I will be placing on the top of the window. At the moment, for the LED's, I have not inserted them yet but will be putting in 3mm LED's as they require less power compared to the 5 mm ones. There is also a button that I have not pictured yet is the Sync button, I have also but this button on this strip which is on the right of the strip. It's not there yet but I will place it there in the future. LEAK TEST!!! Now I don't know if you can see but I have added the flow meter that I was talking about earlier. It is placed in between the RAD and the Reservoir. I will be leak testing it as well as soak testing it ( pushing the parts to its limits) For the water I inserted De-ionised water as this is Cheap and has less bacteria than normal water (bacteria caused clots and mould to form in places such as the water block etc. causing less efficiency. I have also taken the fan that was on the inside of the window out and put it outside the window because it was causing pressure on the tubing inside the console, now that it is placed outside it cannot do that. I have a total of 3 fans here, all are speed controlled by a controller unit which is placed in the floppy bay. This is good as it can reduce the noise dramatically without shutting the fan itself. The project has been finished and I have tested it by playing a few games on the machine, I will try to get a video going later. The project needs a few finishing touches like to correct the airflow direction, tidying up etc.. This is the front which is quite nice because everything is hidden until you open it up like a door. I have stealthed the DVD drive and now it is undetectable without pressing the eject button. Sorry, I took this picture whilst the unit was off. This is what everything looks like when its finished. Ok - it might be a big but that's my project and for it to do its doing now, it would take alot more effort and time to fins a proper sized case for it. Anyway, I like the way this Elite runs. Just a close up of what is inside after being finished. Ok, so back to the DVD drive stealth business, this was tricky as I had to make sure that when it closed up, the edges did not catch on anything so the alignment had to be perfect. The power button on the case powers on / off the xbox and the restart button on the case ejects and closes the DVD drive. This way I can use the cases own professional buttons and not wiring my own ones. 2) Place anti kink coils as the tubing is going to packed out in a small place so we don't want any flow to be reduced! 3) Delete all grey metal visibility into black! 4) Tidy up the wiring a lot! 5) Remove the Exhaust fan on the side and replace with a wire mesh! Drained the water out! No mould of any sort inside! Unfortunately the metals on the pump and the barbs have gained a minor coating of rust. This therefore delayed the time the who project took because I had to clean everything up and coat it with lithium Grease which should protect it for a long time. Removing the 'stupid' old piping !!! The pipes that thermaltake supply you with are not flexible enough for the type of application we want them to do. All piping removed at last! Started the initial piping with the UV green anti-kink coils! All the piping is now done and fully tightened! Lights off! UV Coils can be seen nicely huh! Wiring has been tidied up a bit in this pic! Finished the inside of it with black card on every grey metal bit inside. This makes it look absolutely AWESOME! !